This might be my favorite Sephora Play! box yet. I’m just going to throw that out there. I am literally having to talk myself out of buying the full size of Every. Single. Product. They were that good. 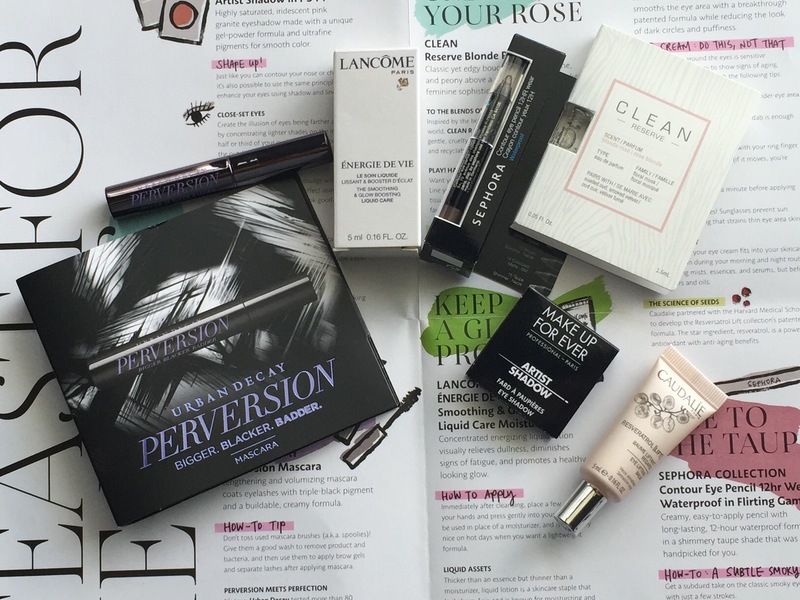 So be warned: If you love eye products and are easily persuaded to head to your local Sephora and buy all the things, you may want to close out this post now. But if you’re a glutton for (really pretty) punishment, read on. This month’s theme was “The Eye Openers.” How cute is the bag (pictured below)? All of the products (except one) were specifically made for use on the eye area. Perfect timing: I’ve recently discovered the joy of/need for eye creams, and I am on a lookout for different items to try. I’ve only recently found a drugstore option I like (the Cerave Eye Repair Cream) but as much as l love affordable products, I’m open to high end options for something like this. My bag included five items: a facial gel moisturizer, an eye cream, an eyeshadow, an eyeliner, and a mascara. And of course, the bonus fragrance. (Hated the fragrance. Everything else was amazing. I’ll take that ratio any day though.) The other thing I loved was that you could use everything in this box at once–I recently used all of the products on one day and just loved the results. I’ll start with the only item that was not meant specifically for the eyes, and the item that most confounded me when I opened the box. (Thank goodness for Sephora’s cards that come with each box, right?) This was the Lancome Energie de Vie The Smoothing & Glow Boosting Liquid Moisturizer, and according to Sephora’s card it is a type of moisturizer used more commonly in Asia. It has a thin, almost watery gel-like consistency, and feels mildly cooling on the skin. According to Sephora’s instructions, you should press it into your skin, like you would a primer, and it can be used with your moisturizer or instead of it. I was skeptical that this thin gel could work as a moisturizer, especially for someone like me with dry skin, but believe me when I tell you, it worked and felt amazing. I loved how easily it glided on the skin and how quickly it sank in–it felt like I was wearing nothing, yet my skin glowed. It really did feel energizing. My skin never felt dry throughout the day, and I used a matte finish foundation which is typically not overly moisturizing. I am thrilled–I don’t always love the feeling of having a serum, then a heavy moisturizer, then possibly a primer, then a foundation–I mean how many layers of product can I put on my skin? On top of that, I’m trying to get ready for a long day of being in front of a classroom and in meetings while trying to get a preschooler ready as well, all by 7:45 am. I don’t have time to let every layer of face product sink in like it should, so I always work that my makeup won’t sit right on my skin. Having such a thin moisturizer that also provided a natural glow took two layers (and thus at least ten minutes) out of my morning routine. In short, I was surprised and excited at how much I loved this. Will I buy a full size? Most likely, but not right now. This would be a perfect moisturizer for the summer when my skin is less dry, but since we’re heading into fall, this probably isn’t the best option for me right now. I will save the rest of this sample, though, to use in the fall-winter months. While my guess is that it wouldn’t provide enough moisture, I was wrong about this once before. The Sephora website does say that it it intended for dryness and dullness, my two biggest winter skin issues. I will give it another try in late September when I first notice my skin getting dull, and if it works well, then I may go ahead and buy it. It retails for $55 for 1.69 oz., so I want to be sure before I purchase a full size. YOu only need a pes-sized amount, so it would last for a while. 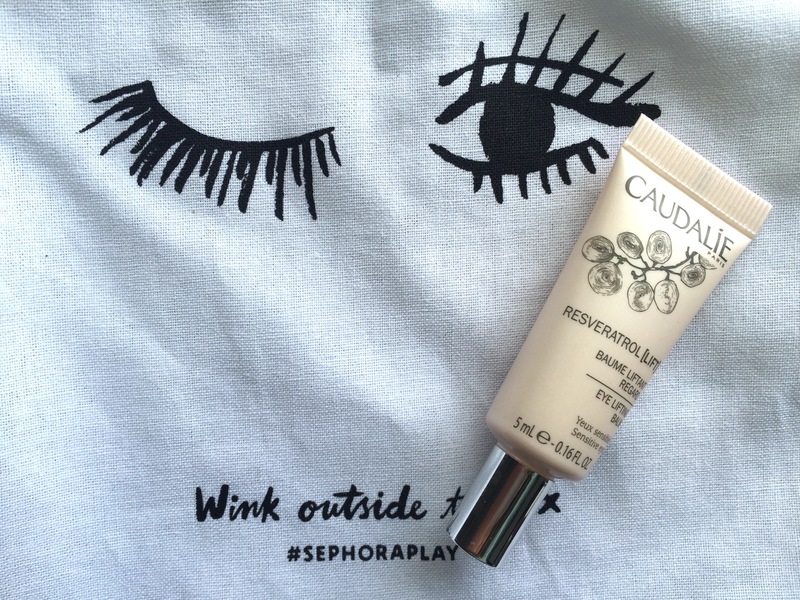 Next, I received the Caudelie Resveratrol Eye Lifting Balm. It claims to hydrate, lift, and firm the eye area, and says it can be used night and day. I tried this both at night and in the morning, and I think it works best as a morning eye cream–it lifts and firms immediately, just as it claims, which makes it perfect for under your makeup. I typically stick with my Cerave eye cream for before bed, and use this one in the morning. Will I buy a full size? Well, it retails for $62 for 0.5 oz., so I will probably try a few more options before I spend that much, especially given how much I liked all of the other products in the box. Also, you need to use so little that the sample will last me quite awhile. I’ll try it alongside a few other creams, but this is definitely a strong contender for a morning eye cream, as the Cerave is not my favorite under makeup–it doesn’t sink in quickly enough, and I feel like it makes my eye makeup slip around a bit. Next, I received a Make Up For Ever Artist Eyeshadow Single in I-544; I believe that shade is called Pink Granite. It is such a stunner–it looks taupe in the pan (and unfortunately in the image above), but on the lid is a pale pink/steely gray duochrome with an iridescent finish. I used it for a one shadow look: I placed it in the crease, packed it on the lid, and then sheered it out over the browbone. I loved the effect–it was such a simple makeup look but the color was just so interesting, unlike anything I have. It was nicely pigmented and stayed on all day. Would I purchase a full size? Yes, but for the color, not the formula. Don’t get me wrong–the formula is great. It just isn’t so different from my other eyeshadows that I feel like I need to switch to Makeup For Ever eyeshadows as my go-to. The website describes it as a gel-powder eyeshadow, and while it is very creamy, it is not as novel as this makes it sound. But the color is so unusual and I have such a weakness for pink and gray combos. It retails for $21 for a full size single shadow (2.2g). This color is definitely worth it. If you like the formula, I’m sure the other 197 (!) shades would be beautiful. It does come in a temporary package, so you’d need to move it to a z-palette or another empty palette (Make Up For Ever sells these as well–they are described in the shadow instructions on the Sephora website). The next item in the box was a Sephora collection Contour Eye Pencil 12 hr Wear Waterproof. I received mine in Flirting Game, a shimmery gray-toned taupe shade. It was the perfect eyeliner to complement the Makeup For Ever eyeshadow. As it says, it is waterproof, and works like a gel liner–it glides on and does not budge throughout the day. They come in glitter, matte, and shimmer finishes–it looks as though Sephora has 25 different colors to choose from. Would I repurchase? Absolutely. I plan to head to my local Sephora and grab a couple later this week. They are only $10–that’s a great price for such a good item, barely higher than similar drugstore items. I’ve loved the Sephora collection products since college, and this eyeliner/shadow stick line is beautiful. I love a good gel liner, and this was fantastic–it goes on smoothly, doesn’t budge, and comes in a great range of shades. If you want a slightly more affordable option, the NYX Slide-On Liners are some of my favorites, and they are $7.99 and are often on sale. What might make the Sephora liner worth purchasing over the NYX is that they have a larger range of neutral shades. If you love neutrals, this would be a great option for you. 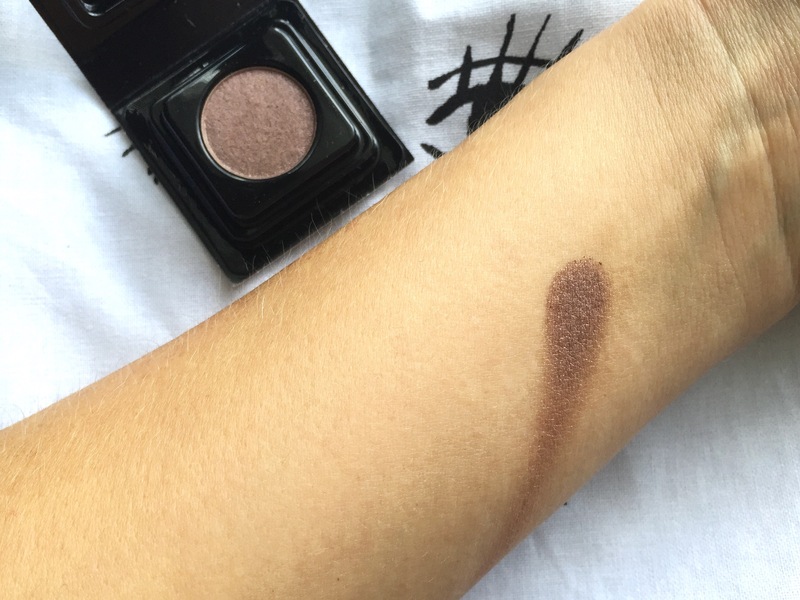 If you just want a basic black or brown, however, the NYX would work just as well. 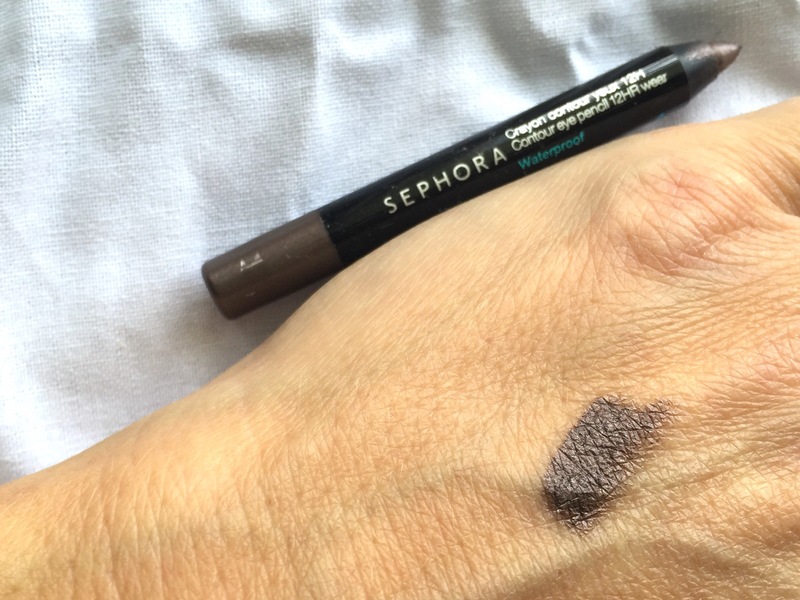 But since the Sephora liner is only $2 more, it really is still a great budget-friendly option. Finally, I received a sample of the Urban Decay Perversion mascara. I love a mascara with a full brush, and this is the fullest of the full. It separates, lengthens, and adds volume to your lashes–truly, what more could I ask from a mascara? I have been a devotee of drugstore mascaras my entire life, and I have both old and new favorites: Rimmel’s Lift Me Up is my go-to (and it smells like cucumber–so refreshing! ), and Cover Girl’s Lash Blast Volume is my favorite waterproof mascara. More recently, I’ve discovered Essence’s Lash Princess, which really does give your lashes the closest appearance to false lashes I’ve ever seen in a mascara, drugstore or otherwise. But this Urban Decay mascara is testing my drugstore devotion. Whereas the Essence mascara looks like false lashes (thicker, fuller, darker, etc.) 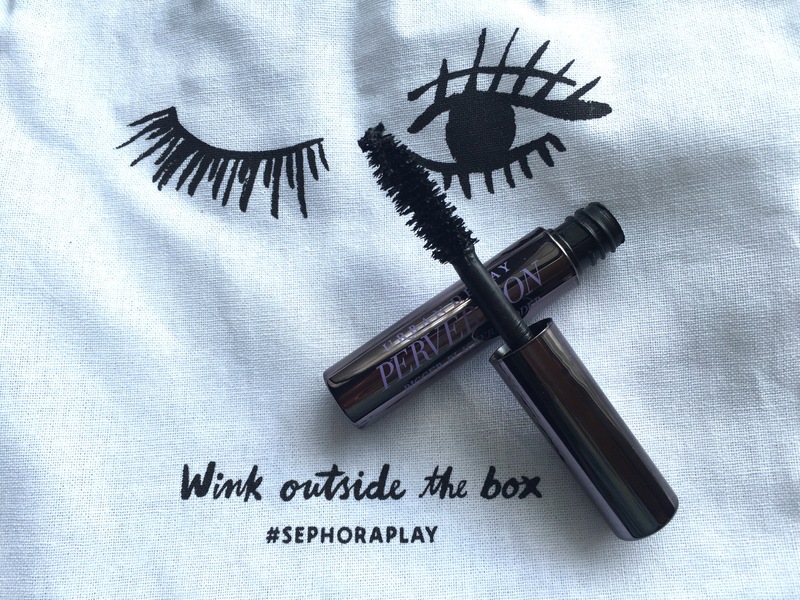 the Perversion mascara looks like your own lashes are just naturally that full and lush. It is a slight difference, but a significant one. Would I purchase a full size? Well, if you like high-end mascaras, I think it is one of the best I’ve tried. And I really do love the effect–it is probably my favorite mascara that I currently own. It retails for $22 for a full size. But in order to be a responsible consumer, I have to ask myself: Do I like it enough that it is worth more than double the price of my current favorite mascaras (it’s actually four or five times more expensive the the $4.99 Essence mascara!)? That I don’t know. And if I decide I want to splurge on some of the amazing skin care products in the box this month, I may want to hold off on the mascara. This is where I really think personal preference, budget, and self-awareness must come into play. But in the end, it is a great mascara and I can’t wait to keep using the sample size. And bonus: Sephora does sell the sample size (they call it a travel size) for $10! Since I love the size of sample mascaras anyway, and because I am constantly testing new mascaras and probably wouldn’t use a full size before it expired, this might be the best option for me. I don’t want to feel guilty about spending a ton of money on something that will sit in a drawer with 10 other mascaras. Maybe it’s not the best financial value, but the best option for my habits. Which in the end is the better overall value. And of course, there is the fragrance sample. 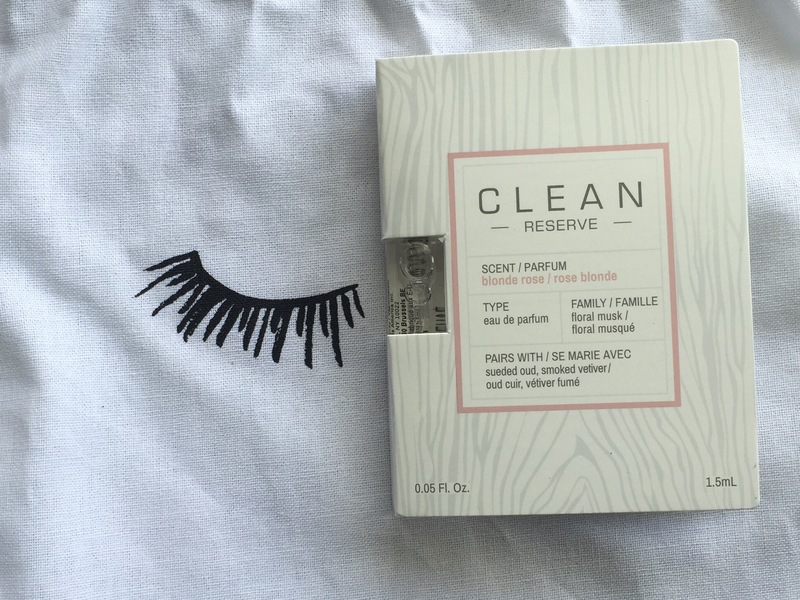 This month’s fragrance was the Clean Reserve Blonde Rose. I did love that this sample came in a mini spray bottle, rather than that flimsy pull-off top that so many small perfume samples have. But, as I already said, I hated this fragrance. And for one specific reason: I just really don’t like musks, and this fragrance describes itself as belonging to the “floral musk” family. If you like musks, however, this might be a great fragrance to try–it smells like clean laundry and I could see how that would be very calming and fresh. I just can’t get past the musk. I will say, though, that this is the first fragrance I’ve received in a Sephora box that I wouldn’t at least wear, so that’s not bad. If you think this would be a good choice for you, it retails for $25 for a 0.34 oz spray, and $90 for a 3.4 oz spray. Final Word: This is a wonderful selection of products, and really solidified my love of the Sephora Play! subscription box. I wish I didn’t love every product so much–now I have to be very discriminating when I decide what to purchase! My reviews of each product may be a little tougher for that reason–I would honestly purchase a full size of each and every one of them, so I am really trying to parse details to decide if it is a product I actually need and will use. But you couldn’t go wrong with any of them. 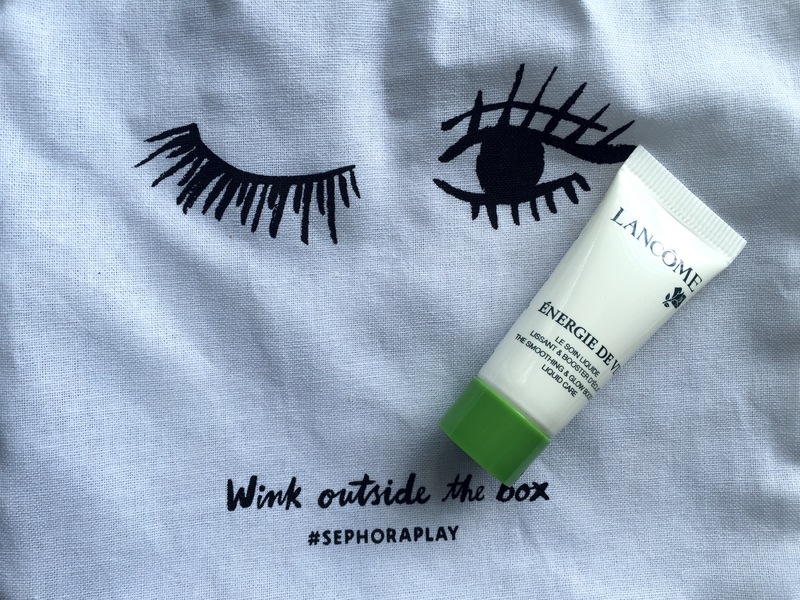 If I had to choose one standout, it would have to be the dark horse (for me) of the box: the initially confounding and ultimately amazing Lancome Energie de Vie. I thought this would be the one that would be least useful and now I want to use it every morning!